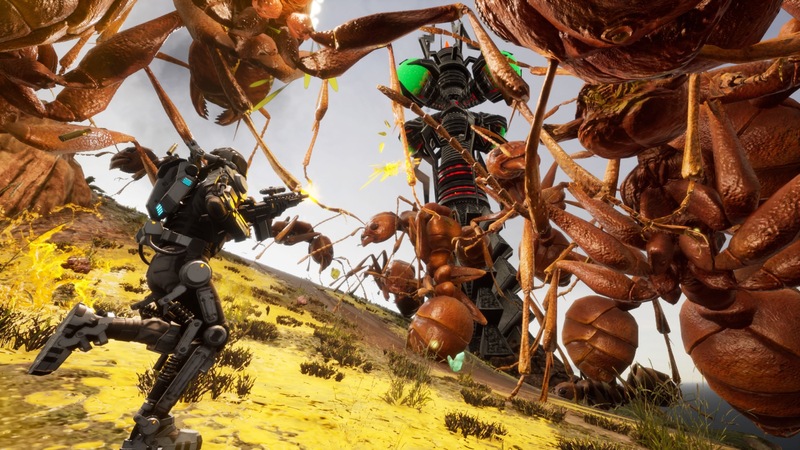 Ahead of the launch of Earth Defense Force: Iron Rain, PlayStation LifeStyle got a chance to sit down with Series Producer Nobuyuki Okajima to ask him some questions, with the help of a translator, about the upcoming action game. We also got our hands on Iron Rain itself, in both single and multiplayer modes. One of the biggest takeaways from the preview event is that Iron Rain is a game that is aimed towards a Western audience, as opposed to the previous entries that have been more focused on the Japanese market. As such, this entry features a lot of changes, so if you’ve never really gotten into or heard of Earth Defense Force, this one might be one to keep your eye on—especially if you’re into killing giant bugs from space. It’s action-packed and over-the-top. Joseph Yaden: So, I’m a newcomer to EDF. I’ve played Earth Defense Force 2: Invaders from Planet Space on the PS Vita and I’m not very good at it. Do you think Earth Defense Force: Iron Rain is a good EDF for newcomers who have never played the series before and can just dive right in? Nobuyuki Okajima: It’s a perfect game for newcomers who have never played EDF before. Our whole concept is providing a game to the Western audience that have maybe heard of the EDF name or maybe not. But the world view and the systems are perfect for newcomers. Good to know. So you bring up the point of it being marketed towards Western audiences and I think that’s part of why you’re working with Yuke’s, right? But it’s interesting because Yuke’s is mostly known for their wrestling games. So, what else about Yuke’s drew you to them and made you decide to partner up and make Iron Rain? Oh, that’s a good point. Since you’re [aiming] Iron Rain towards a Western audience, do you think it might have the reverse effect, where it [could] alienate the Japanese players? With the past EDF games, they’ve been sort of popular here, but they’ve been way more popular in Japan. Do you think it might be really popular here, but not so much in Japan? I don’t worry about that—the reverse effect. Do you have any plans for post-release content? I know that’s really popular with a lot of games now. You don’t just buy a game once, play it once and are done with it. A lot of games are thriving on stuff coming out afterwards [like] DLC [and] that kind of thing. Is that something that’s on your mind for this game? We are considering some additional content, like weapons and items. Some of them, we’ve already announced. Like, we made an announcement for a preorder [that comes with] a large DLC. And I know with the multiplayer, since it might be a really big thing that a lot of people play, do you have any plans for microtransactions? The staff and I at PlayStation Lifestyle are really involved in trophy hunting. How involved are you with [deciding] what the trophies are like and how difficult they are? We have many trophies, from very easy ones to very difficult ones. I think we [have] a really good balance. And how long, approximately do you think it would take to get the Platinum trophy? How long has Iron Rain been in development? Maybe like, two and a half years. Almost three years, if you count from the very beginning. And looking past Iron Rain, what do you think the future of Earth Defense Force looks like? Maybe something for next generation? Do you have any ideas or plans for that? I cannot talk very much about the details of the next generation [for] EDF, because of many rumors going [around]. But the classic numbered EDF series will remain the same. Iron Rain is a spin-off and it has its own universe and stands by itself. Interesting. I was kind of wondering if Iron Rain was maybe a continuation of the other ones, or if it’s its own new thing. So if Iron Rain is successful, [is it possible] that we’d see a continuation or something that kind of looks like this one? If it is successful, then maybe Iron Rain 2, or something, yes. One thing I noticed almost immediately when comparing Iron Rain to the older ones is that it had a similar change [of direction] to the one Monster Hunter World had, where it was really aimed towards Western audiences. Do you think that comparison is accurate? Do you think Iron Rain will appeal to us [in the United States] the same way Monster Hunter World appealed to us? I would have to wait for the release to see. But I think [what we’ve done] so far has been really successful in the West. The game basically will be what we’ve done before, but more focused towards gamers over here. If you take some locations like San Francisco, you’ll find that that you can relate to it much closer than Tokyo or something in Japan. Do you think location is the biggest [aspect] when aiming towards a Western audience, or do you think that there are other things that play a factor, too? It may be the biggest thing, but it’s not the only change [introduced]. The game system itself is comparable to [that of] an FPS, and the graphics are more realistic. Will you be picking up a copy of Iron Rain when it launches on April 11, 2019? Let us know in the comments!